If you’re anything like the rest of us, it’s a day of excesses – a flood of people, a table filled with turkey and trimmings, and, if true to the spirit of season, a deep sense of gratitude for our abundance of blessings. We don’t have to count the number of times someone flushes the toilet to realize how much water is flying through the pipes! But that doesn’t mean, as good stewards of our resources, we can’t tweak a few of our traditional preparations to make better use of our water supply. Hopefully, these are habits you practice every day; if not, it’s a good time to give them a test run. If you have an inkling of the water footprint your typical Thanksgiving feast leaves behind – the turkey alone accounts for 468 gallons a pound – conserving water where you can makes a lot of sense! Make us proud this Thanksgiving! 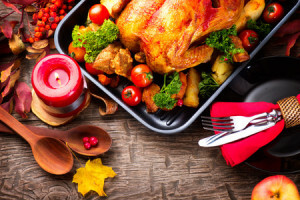 • About that turkey … if it’s frozen, defrost it for a few days in the refrigerator rather than running it under a stream of hot water the day before. Think how much easier it will be to pat dry before filling it with various savories! • Scrub your potatoes, yams and other fruits and vegetables with a vegetable brush in a standing sink of water rather than under a running stream. When you’re done, use it to water your houseplants! • Barely cover your potatoes when boiling them, and afterwards, save the water to give a boost of flavor to other dishes. Why use plain tap water when that starchy water can add a depth to your giblet gravy or a strong vegetable base to the next day’s turkey noodle soup? Here’s another tip: if you’re steaming vegetables, put the strainer on top of the potato pan and knock two things off your list at once. Bonus: you’ll have an even tastier broth for next-day dishes! • While preparing the meal, and while cleaning up afterwards, use the garbage can (or even better, your backyard compost pile) to get rid of organic leftovers. Give the garbage disposal a rest, conserving the water needed to stream through it. • Fill containers with water and chill in the refrigerator for refilling drinks at the table. The cold water is more refreshing and you won’t have the run-off at the tap. Pass on bottled water; it takes 1.5 gallons to manufacture the plastic bottle alone! • Use the dishwasher. You won’t have any problem filling it and you’ll save untold gallons of water by not washing and rinsing in the sink. Don’t have a dishwasher? Fill your sink with wash water and rinse water rather than doing the dishes under a steady stream. • And about that toilet! Fill a gallon jug with water and put it in the tank, reducing the amount of water used each time someone flushes. See, you’re getting this down! You’re making us proud!